LinkExchange SearchMe WhatWeDo AboutUs Sitemap Next page When to harvest onions. 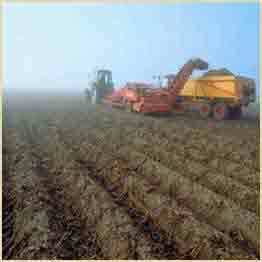 The right time to harvest potatoes chiefly depends on their final destination. New potatoes, which are unripe, should not be stored because they will sprout. Work out the right time to harvest potatoes. The right time to harvest potatoes depends on their final destination. One of the most important factors is the decision whether or not to store them. 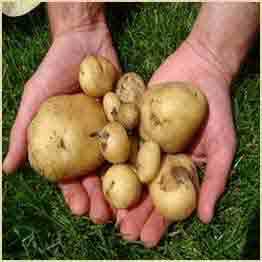 Should you decide to store them, you must leave the potatoes to ripen completely in the ground. See also: Storage systems. The differences between harvesting new potatoes and ripe (mature) potatoes. When the leaves on the potato plant turn yellow, and the potatoes come out of the ground with ease, this means that the potatoes are ripe. If the potatoes are to be stored, rather than eaten immediately, then they are left in the ground so that the skin thickens. A thicker skin will prevent diseases which arise during storage, and also prevent the potato from losing water and shrinking. 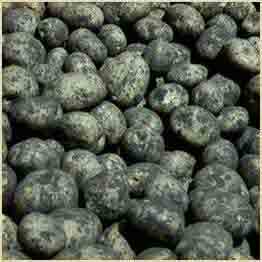 However, if they are left in the ground for too long, the potatoes are more likely to catch a fungal disease known as black scurf. Foliage conditions for harvesting new potatoes. Harvesting new potatoes and leaving them in rows. Recently harvested new potatoes are: very tasty, but NOT suitable for storage. 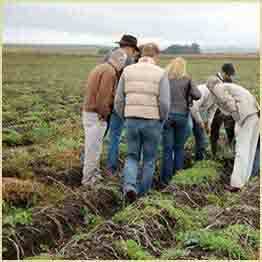 Field conditions for harvesting mature potatoes. Harvesting ripe potatoes and then lifting them directly onto a tipping trailer. Storing ripe potatoes; on this occasion they will be made into chips (french fries). Close-up of the above photo, where you can see that the potato plant is dried out; the green plants are actually just weeds. A field of ripe potatoes, just before harvest. The potato plants are already dead. The green plants you can see are weeds. 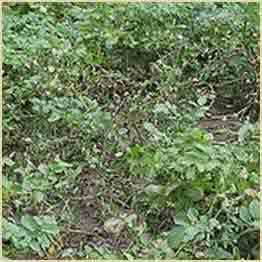 To facilitate the new potato harvest, the foliage should be removed from the plant two weeks before harvesting the potato. 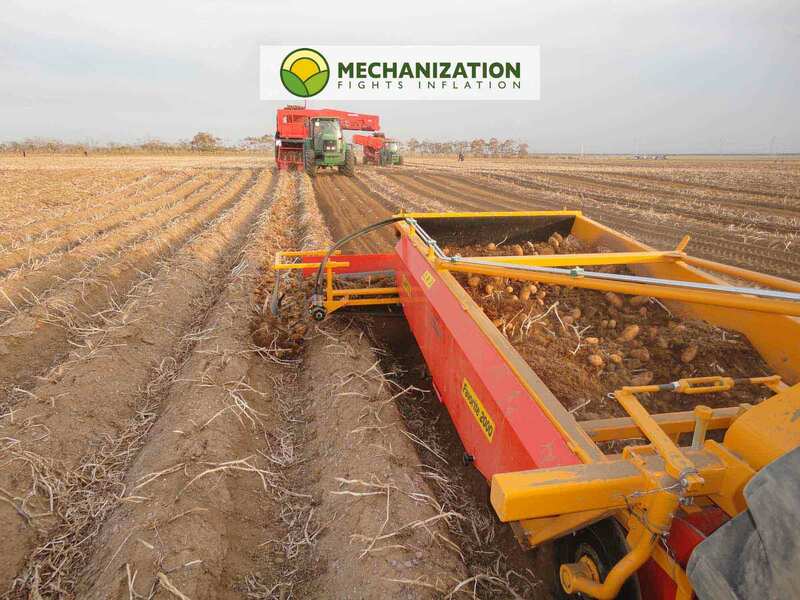 Depending on the volume of the harvest, the potatoes are unearthed using a fork, plough or potato harvester, which pulls the plant out of the ground and removes the earth from the potato through vibration or blown air. 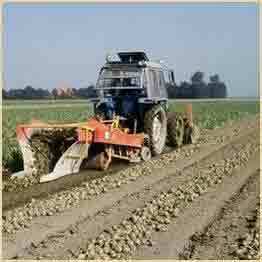 During the harvest, it is important not to damage the potatoes, as this will cause defects and disease during storage. Next up: When to harvest onions. On the other hand, matured potatoes, whose leaves have almost all died and gone yellow, can be stored for several months under the right conditions. See: How to store potatoes. Generally speaking, new potatoes, which are barely ripe, go straight to market while they are still fresh.